On Valentine's Day (Feb. 14), NASA's Stardust-NExT spacecraft will make a close flyby of comet Tempel 1, zipping to within just 124 miles (200 kilometers) of the icy wanderer. The mission will mark the second time a spacecraft has visited two different comets (Stardust's original mission was to the comet Wild 2) during its lifetime. It's also the first time two different spacecraft have visited the same comet after years of spaceflight. 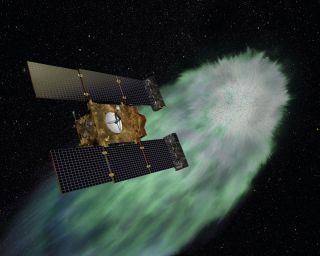 NASA's Deep Impact mission sent a spacecraft to rendezvous with comet Tempel 1 in 2005 to intentionally slam a probe into the icy object to look inside the comet. The Deep Impact spacecraft was later recycled to visit another comet – Hartley 2 – in 2010. Here's a brief overview of the spacecraft and its mission. Does Stardust-NExT have anything to do with NASA's old Stardust mission? Yes — it's the same spacecraft with a different mission. NASA's Stardust probe launched back in February 1999, tasked with gathering bits of dust and gas from around comet Wild 2 (pronounced "Vilt 2") and sending the sample back to Earth in a return canister. The original Stardust did its job. It flew by Wild 2 in January 2004, and the comet material it collected made it to Earth two years later. Since the probe was still in good shape and had a fair amount of fuel left, NASA gave it a new mission in 2007 — to meet up with comet Tempel 1 this year. Another NASA mission, called Deep Impact, visited Tempel 1 back in 2005. But it did more than visit: Deep Impact slammed an impactor into Tempel 1's surface, then studied the ejected material to get an idea of what the comet is made of. Another aim is to extend geologic mapping of Tempel 1's surface, adding to the work done by Deep Impact. Through making these and other observations, Stardust-NExT can contribute to scientists' understanding of how comets formed at the solar system's birth and how they have evolved since then, researchers have said. Comet Tempel 1 is 3.7-mile-wide (6 kilometers). It completes an orbit every 5 1/2 years, so it has circled the sun once since Deep Impact's visit. Stardust-NExT will make its closest approach to Tempel 1 around 11:40 p.m. EST on Feb. 14 (0440 GMT on Feb. 15). At that time, the probe — zooming through space at around 22,400 mph (36,000 kph) — will come within 124 miles (200 km) of the comet, snapping pictures and making measurements all the while. This NASA video describes the Stardust-NExT probe's Valentine's Day encounter with Comet Tempel 1. In the 1960s, the late comet hunter Brian Marsden studied Tempel 1's disappearance and predicted it would return in 1967 and 1972. Indeed, the comet was returned on June 8, 1967, then again in January 1972. Is there another comet encounter in Stardust-NExT's future?